The reservoir belonging to the Lutz Oberstufe power plant in Raggal, Austria, holds the water of the river Lutz behind a 100-metre-wide dam. The storage capacity is as much as two million cubic metres of runoff water, made available to the power plant 130 metres below as required. Since the Lutz experiences strong runoff when the snow melts in the mountains and during heavy rains, the plant also contributes to flood protection. At the same time, the dam in Raggal inevitably catches the sediment carried along in the water, and siltation has reduced the holding capacity of the reservoir over the decades. For this reason, a dredger was permanently stationed here as long ago as 1986. After 21 years of continuous operation, it was time to replace the old dredger with a new, more powerful machine. The machine also had to take into account stringent environmental regulatory requirements and the shorter annual operation period. 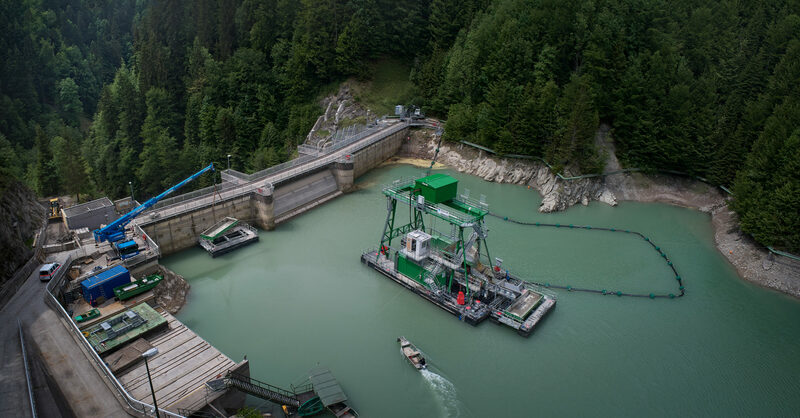 A 4.2 m³ grab dredger was specially designed for use in the Raggal reservoir with several state-of-the-art components. The purely electrically driven excavator ensures that noise emissions are as low as possible. The plant is equipped with a plate conveyor for discharging the dredged material onto a roller screen, which separates any elements in the dredged material that have a diameter larger than eight millimetres. Tree trunks, clay chunks and rocks are transported via a conveyor belt into one of the two pontoons next to the dredger. The containers located on the pontoons are lifted by crane and then emptied at a separate location, while the finer sediment is pumped back in the river behind the dam. This reflects the fact that environmental regulations require that all material brought to the dam by the river continues through the ecological system downstream. The dredger is allowed to operate for six weeks per year only, after which the pontoons used for the transport of larger materials are connected as additional floaters to lift the dredger and park it at the special drydock station next to the reservoir.